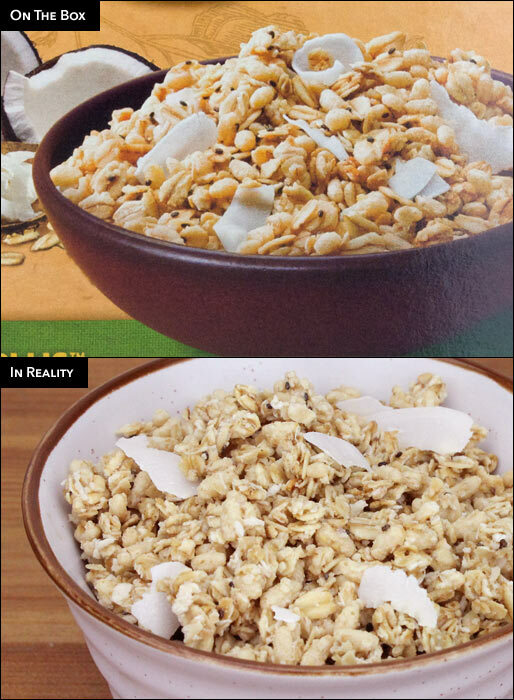 The first thing you notice when open the box is that this Chia Plus cereal actually looks like the picture on the box. There's plenty of fairly large coconut shavings - enough that you get one in every other bite. I found those coconut piece to be kind of a bonus because there's a coconut flavor throughout the granola and you don't necessarily have to get a piece of coconut to taste it. The granola itself is lightly crunchy with a toasted oat flavor and just a hint of a poppy-esque seasoning from the chia. It's sweet enough that you'd never consider adding sugar. There's a few medium-sized clusters in the box, but not enough to get excited about. The granola stays fairly crisp in milk for upward of 5 minutes. Overall, I really enjoyed this granola. I'd buy it again if the price was right. Fans of coconut and granola won't be disappointed. Nutritional Considerations: Each 3/4 cup serving has 270 calories, 11 grams fat (4 grams saturated and 0 grams trans), 0 mg cholesterol, 50 mg sodium, 36 grams total carbs, 6 grams dietary fiber, 9 grams sugar and 5 grams protein. 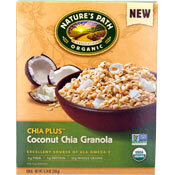 What do you think of Coconut Chia Granola? I thought it was awesome. 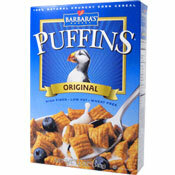 I dumped it on cereal, ate it as cereal and, heck, I even used it as a crumble topping on muffins.